Perfect for online magazines, dynamic news websites and other editorial related projects! MH Magazine WordPress theme comes with a bunch of great features, options and custom widgets to create efficient online magazines and news websites within a few minutes. This WordPress magazine theme is the perfect solution for bloggers, journalists, editors, seo experts and everyone who wants to focus on publishing high-quality content. We are proud to serve our premium customers on a daily basis and help them create awesome high-quality websites. Premium magazine WordPress themes by MH Themes are running on thousands of websites from all kinds of genres. Our high-quality magazine WordPress themes are translation-ready and used by thousands of customers around the world. MH Themes is specialized in premium WordPress themes for modern online magazines, dynamic news websites, professional blogs and other editorial websites from any content genre. All premium WordPress themes are fully responsive and have great features, helpful options and awesome custom widgets included to create nice magazine like websites in no time. In addition the magazine themes are translation-ready and also support RTL languages. We focus on our existing professional magazine WordPress themes instead of releasing new themes every month to ensure quality and maintenance. Magazine WordPress themes by MH Themes have a clean and optimized codebase and SEO-friendly structure to help you achieve good rankings in search engines. For website performance an optimized server at your host is the most important aspect and our clean and well-coded WordPress themes can contribute to that as well. WordPress themes by MH Themes can easily be translated into any language that is supported by WordPress, including languages written in right-to-left (RTL). We make use of the WordPress customizer for all theme options so that you can easily manage and configure the layout of your website including live preview. Magazine WordPress themes by MH Themes are optimized for professional editorial websites with focus on monetisation and presenting lots of content. We offer quick and helpful theme support through our professional helpdesk in case you have any questions about the configuration or usage of your WordPress theme. In order to keep your website safe and reliable, it is important to keep everything up-to-date. We offer regular theme updates to ensure that your website will not let you down. In addition to our themes we offer a professional theme installation service where we can install the theme for you and configure the layout like the theme demo. In comparison to classic blog themes, magazine WordPress themes usually have a professional and dynamic layout to prominently display lots of content from various topics on your front page. 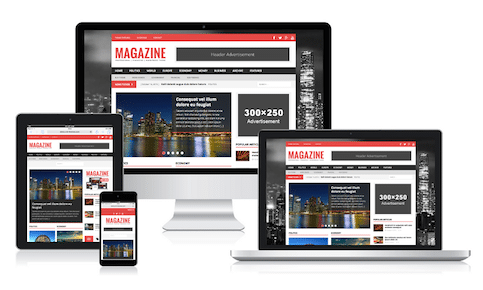 Magazine WordPress themes usually are optimized to display advertisements and banners at various locations across your website to help you earn money and monetise your website content. With the dynamic and content-rich layout of magazine themes for WordPress, your regular blog can be transformed into a professional news website like Fox News, CNN, BBC, Huffington Post or else.